Bill Bewsher passed away last weekend in Tasmania. BSAR extends its condolences to Bill’s family and friends. Bill was a leading figure within BSAR’s history and had a tremendous influence on the course of search and rescue for two decades. He was appointed inaugural Convenor and held this position from 1949 to 1956 and again for a year in 1958-1959. Bill also became the first Field Organiser in 1950 and, excepting a fifteen-month tour of duty in Antarctica, held that position until 1970. After retiring from that position, Bill contributed as a Police Liaison Officer until the mid-1980s thereby concluding a 35-year involvement in land-based search and rescue. One of the biggest searches coordinated by Bill was that for Mihram Haig at Mt Baw Baw in June 1955. The terrain was steep and dense and communications were difficult. An amazing 205 BSAR members attended during the search, the largest number on any search to date. 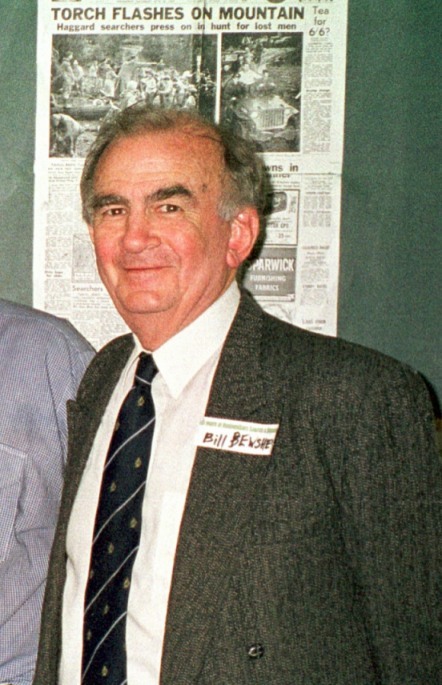 Bill was also a founder and long-time chairman of the Bushwalking and Mountaincraft Training Advisory Board. He fervently believed that the leaders trained by the Board’s leadership courses would contribute significantly to safety in the bush and a reduction in searches.